In the time span from 1955 to 2010, there were only about 3,000 readings in this region, compared to more than 5,000 in Region 3. 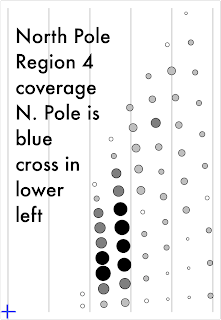 As we move from east to west across Russia, the population thins out and so do the number of weather stations. 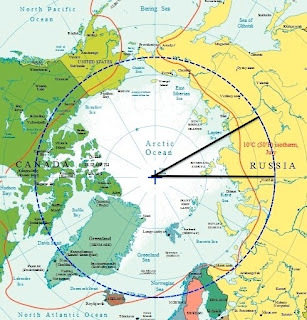 Something that makes this region different from what we've seen before is how much land mass there is above the Arctic Circle, notably the Taymyr Peninsula and the Severnaya Zemlya Islands. 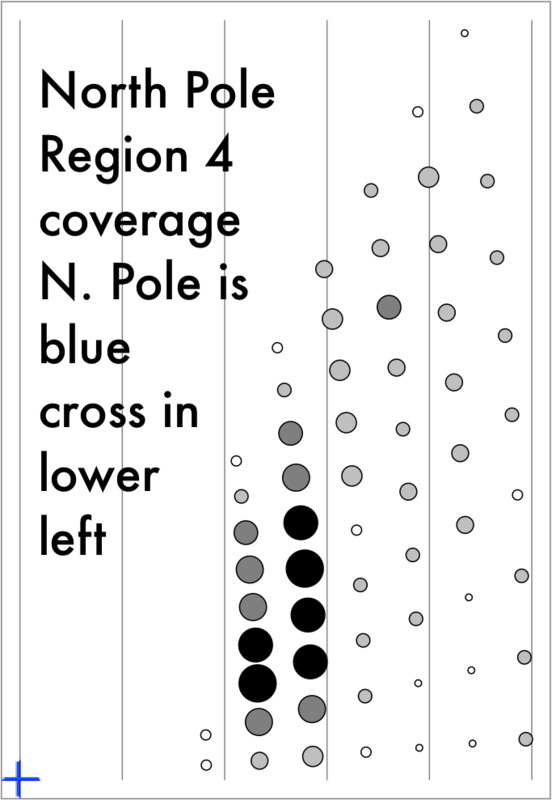 That makes for a very different coverage pattern, with the best covered grid points much closer to the North Pole than in the previous regions. 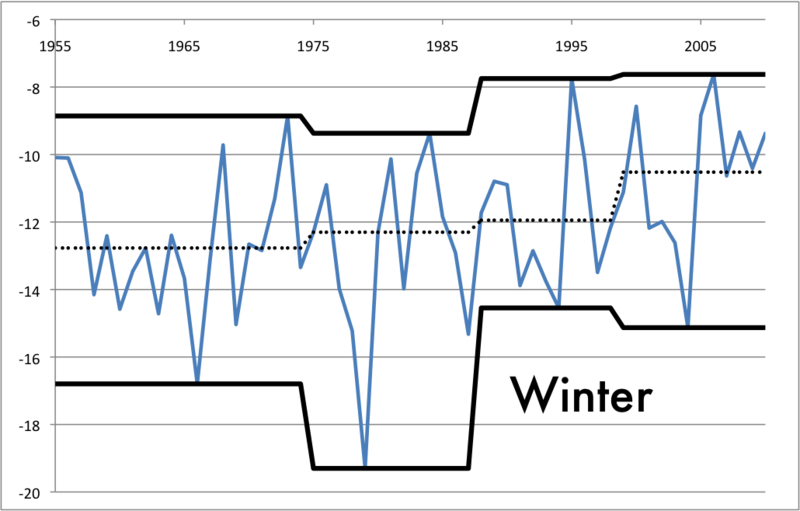 The Winter pattern shows the median temperature is warming interval by interval, with the biggest jump coming from the end of the 20th Century to the beginning of the 21st. 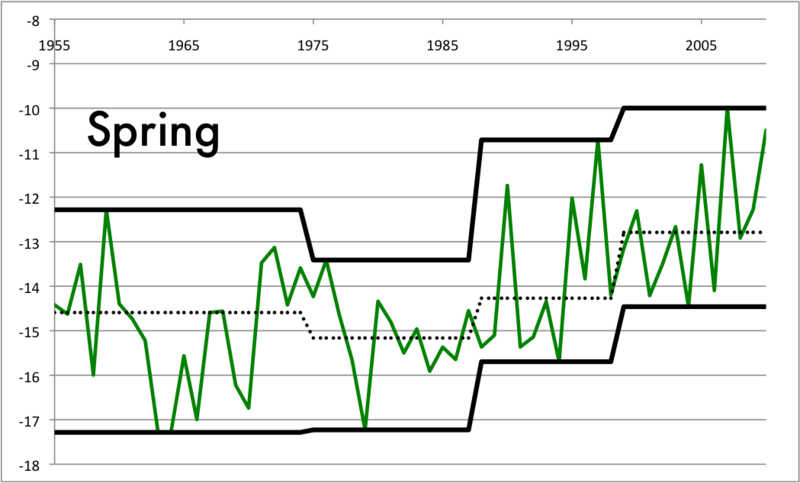 The highest temperatures and lowest temperatures are not as convincingly increasing. 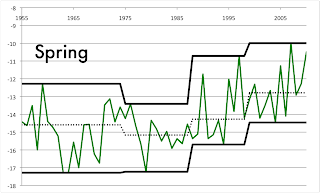 The only data here that does not show steady increase in all three measurements is a record warm Spring in the late 1950s, a record which has been surpassed six times in the last twenty years. 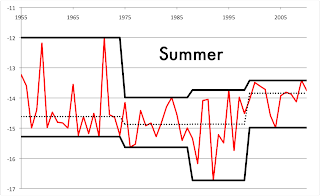 Summers showed a cooling trend through most of the last half of the 20th Century, but warmed in the most recent interval, notably the median and lowest temperatures recorded. 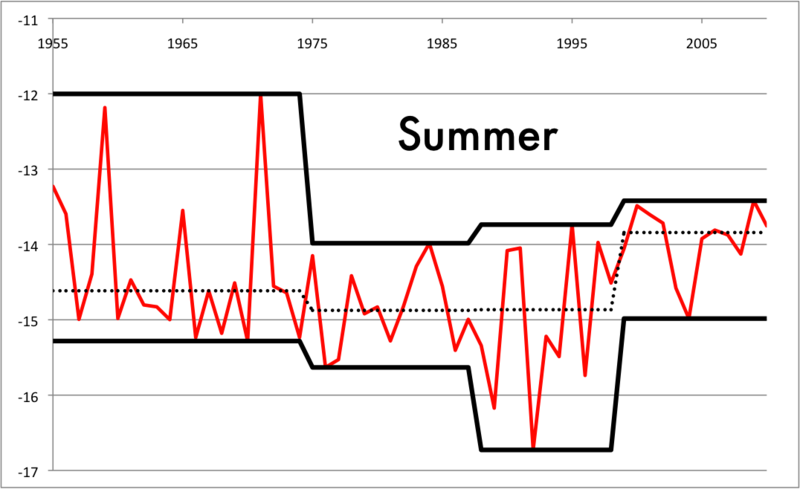 The case for no warming are three warm Summers in the 1950s and 1960s that have not been surpassed since. 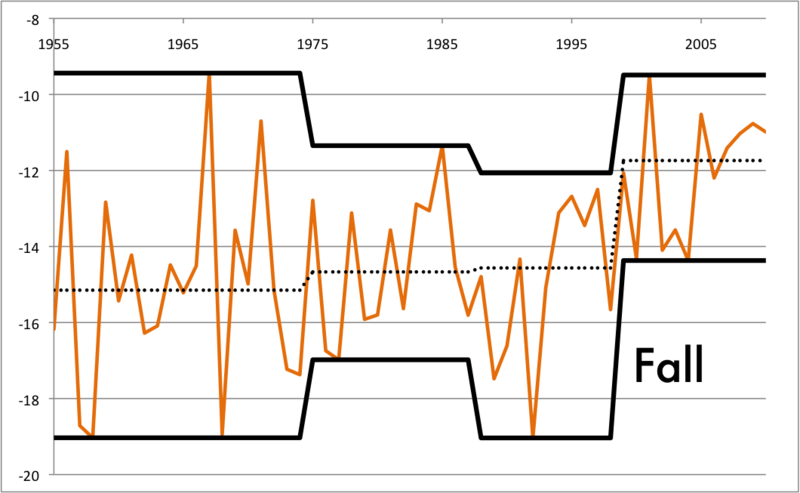 Yet again, a very warm Fall average temperature in the interval from 1955 to 1975 means we do not see the increasing step function for high temperatures, but the median temperatures in all four seasons tell the same story. 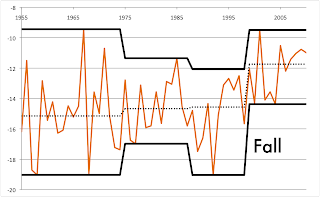 There were only minimal differences between the median temperatures in the eras 1955-1975, 1975-1988 and 1988-1999, but a big jump in the median in the 1999-2010 time period. 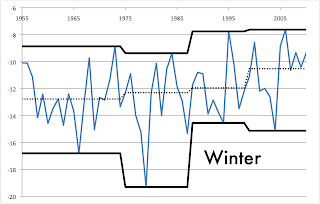 In Winter, Spring and Summer, the jump was about 1° Celsius but the Fall showed a more than 2° jump, which is about 4° Fahrenheit. That's big. Most warmest readings: 1999-2010 with 9, 1988-1999 with 1 and 1955-1975 with 2 each. Most 2nd warmest readings: 1988-1999 with 6, 1999-2010 with 3, 1955-1975 with 2 and 1975-1988 with 1. Most 3nd warmest readings: The early two regions have 5 each and 1988-1999 has 2. Most coldest readings: 1975-1988 with 6, 1988-1999 and 1955-1975 with 1 each. Tomorrow, the Arctic region from 120° to 150° East, getting deeper into northern Siberia.